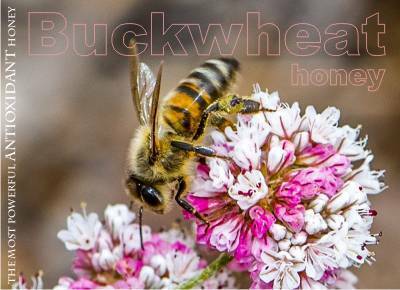 Buckwheat honey – the most powerful antioxidant honey! We all know buckwheat. Not from its latin name, Fagopyrum esculentum, but from its lack of gluten and uses in our cuisine. We know it as grain-like seeds. But buckwheat flowers also make a very powerful antioxidant honey. And, the plant is also used as a cover crop, which is a crop planted primarily to manage soil erosion, soil fertility, soil quality, water, weeds, pests, diseases, biodiversity and wildlife in an agroecosystem (Lu et al. 2000). It is often grown in Minnesota, Missouri, New York, Ohio, Pennsylvania, Wisconsin, Eastern Canada. 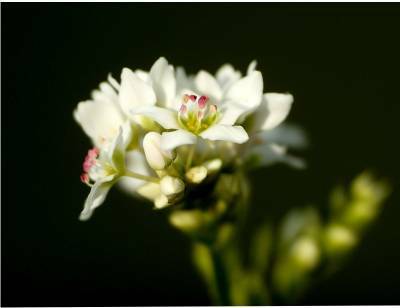 There are other well-known related species: Fagopyrum tataricum, cultivated as a grain in the Himalayas, or Fagopyrum acutatum, also known as Japanese buckwheat and silverhull buckwheat. Buckwheat is not related to wheat, as it is not a grass. It is related to sorrel, knotweed, and rhubarb. It is not a cereal, but a pseudocereal, because its seeds are rich in carbohydrates. And it incorporates the name “wheat” but it has nothing to do with wheat. It doesn’t have gluten, which is probably why it is so very popular and well-known. The name “buckwheat” (or beech wheat) comes from its triangular seeds, which resemble the much larger seeds of the beech nut from the beech tree, and the fact that it is used like wheat. The etymology of the word remains unknown. The seeds contain starch (amylose and amylopectin. ), proteins (high concentration of all essential amino acids, especially lysine, threonine, tryptophan, and the sulphur-containing amino acids. ), minerals ( iron, zinc and selenium), polyphenols ( rutin, tannins and catechin-7-O-glucoside), aromatic compounds and inositol derivatives. According to wikipedia, in a 100 gram serving providing 343 calories dry and 92 calories cooked, buckwheat is a rich source (20% or more of the Daily Value, DV) of protein, dietary fiber, four B vitamins and several dietary minerals, with content especially high (47 to 65% DV) in niacin, magnesium, manganese and phosphorus (table). Buckwheat is 72% carbohydrates, including 10% dietary fiber, 3% fat and 13% protein (table). Buckwheat blooms in cooler weather and is a short-season crop. The flowers are very dense, making the entire crop look like a thick carpet of flowers. Pollinators greatly increases the yield. Honeybees love its nectar and produce a a dark-colored honey. The world’s largest producer of buckwheat nowadays is China, followed by Russia, Ukraine, and France. In Italy, buckwheat cultivation was introduced around the 16th century but during the most recent decades cultivation of this crop has strongly declined and today it survives only in a few alpine valleys. Buckwheat monofloral honey is mainly produced in North America (Canada and California), China, and in some countries of Europe, such as Poland, Russia, Netherlands, and Germany. Sometimes this honey has a even dark purple color that looks almost black. Buckwheat honey is slightly granular, thick, strong aroma and a distinctive full-bodied spicy-malt flavor. This is surely not a honey to be eaten by spoon from the jar, because of its strong flavor and lingering aftertaste. It crystallizes slow (like chestnut, or borage honeys) and is considered one of the most robust honeys. It is rather hard to find buckwheat honey these days, because buckwheat is being planted less and less as a crop. It has high antioxidant activity. Generally, the darker the honey, the higher its phenolic content and its antioxidant power. · Natural antioxidants in honey. Do we really need antioxidant supplements? It has antimutagenic and antitumor effects. Researchers compared 7 different floral sources (acacia, buckwheat, fireweed, soybean, tupelo and Christmas berry) against Trp-p-1. All honeys exhibited significant inhibition of Trp-p-1 mutagenicity. Glucose and fructose were found to be similar antimutagenic as honey and were more antimutagenic than maltose and sucrose. It has a high antibacterial potency. Buckwheat honey has been shown to inhibit MRSA, VRE, E. coli and Bacillus subtilis by extensive degradation of DNA elicited by the generation of hydrogen peroxide on exposure (Brudzynski et al, 2012). It has high antioxidant properties. Compared to other honeys, buckwheat honey has a very high content of catalase (36.8 DN). Read more about enzymes in honey. • The study “Effect of honey consumption on plasma antioxidant status in human subjects”, from 2004, showed that chronic honey consumption increases plasma antioxidant concentration. 25 persons had 1.5 grams of honey per kilogram of body weight (~4-10 tablespoons) for 28 days. Subjects were randomly assigned either a honey with a high phenolic content (buckwheat honey) or a lower phenolic content. Total plasma phenolics were measured on day 1 and 29 at 5 different time points: immediately after honey consumption and then again 1.5 hr, 3 hr 6 hr and 24 hour post-consumption. The results indicated that the phenolic content of the plasma on day 29 was significantly higher than baseline (i.e., day one) in both honey groups, suggesting that chronic honey consumption can increase the antioxidant capacity of the plasma. A daily dose of honey raises levels of disease-fighting antioxidants in the blood. • The most famous article “Effect of honey, dextromethorphan, and no treatment on nocturnal cough and sleep quality for coughing children and their parents.”, by Paul I, et al., published in 2007, compared the effects of a single nocturnal dose of buckwheat honey or honey-flavored dextromethorphan, with no treatment on nocturnal cough and sleep difficulty associated with childhood upper respiratory tract infections. 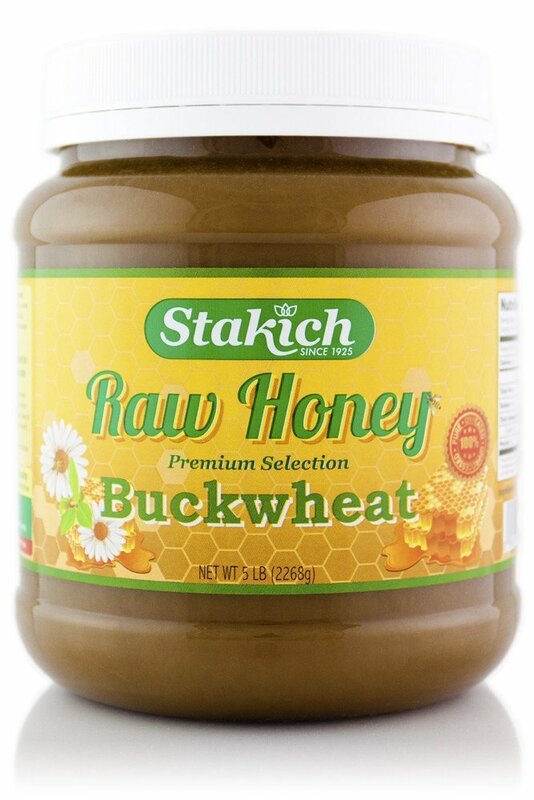 105 kids, ages 2-18 years with upper respiratory tract infections, nocturnal symptoms, and illness duration of 7 days or less, were given a single dose of buckwheat honey, honey-flavored DM, or no treatment administered 30 minutes prior to bedtime. The conclusion: In comparison of honey, dextromethorphan, and no treatment, parents rated honey most favorably for symptomatic relief of their child’s nocturnal cough and sleep difficulty due to upper respiratory tract infection. Honey may be a preferable treatment for the cough and sleep difficulty associated with childhood upper respiratory tract infection. Apitherapists recommend 1-2 teaspoons or so of buckwheat honey as the best cough ‘medicine’ known to man and child (over the age of 12 months) for coughs due to minor colds. – How to make mead at home! – Do you want a homemade mead recipe? – This 9000 years old booze is back on top. Let’s all mead now! – From where to buy mead wine? if not, let Google help you out! Bashkir honey, the most expensive honey in the world, food for astronauts! What cures asthma? Here is a solution from apitherapy: aerosols from the hive!